Hello! Thank you for stopping by blog. The latest revisited sketch is up at Tuesday Morning Sketches and it's a great one by Debbie. I really like this sketch because it has so many possibilities. A true blank canvas. I also like the angle of the focal point. My card features an older set by Sweet n Sassy Stamps. I tried finding it on their website, but it looks like it may be retired. I haven't used my Zig Clean Color Real Brush markers in awhile it was just time I played a little. 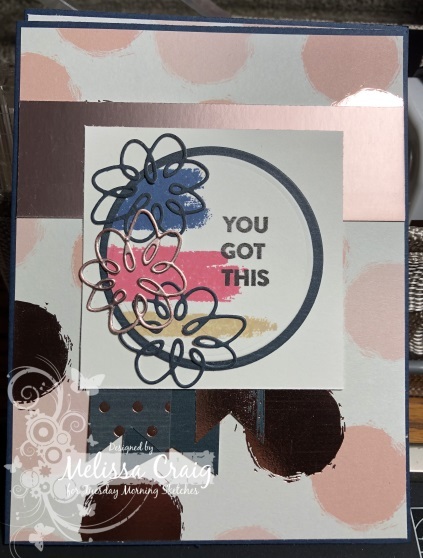 I used the A2 scalloped note card die set from Papertrey Ink to make the card base and focal image. I stamped the image onto Bristol smooth paper and did some really easy watercolor. I am by no means any good at watercolor but this way is super easy and super quick. I used Versa-Fine Black Onyx ink, colored the image and allowed to dry on it's own. When completely dry - meaning I came back to it days later, I over stamped the image using the same ink (I kept the stamp in my MISTI) and heat embossed with clear embossing powder. I also added a sentiment the same way. I decided the base of the card needed just a bit of texture but I didn't have anything here at home so I picked up this really inexpensive background stamp at Joann's - $4.99 but it was on sale for 30% off and then I had a coupon for 20% off my total purchase, including sale items. You cannot go wrong with that! Made the stamp about $2.80. Not to shabby! I haven't stamped with a stamp on a woodblock in years! I didn't like it. LOL As you can see, I didn't line it up well. Here's a closer look at that coloring. I used 4 markers and a water brush. We'll see you over at the challenge blog! Hello! Thank you for stopping by. The revisited sketch is up at Tuesday Morning Sketches, it's Janice's pick and I have to say it's one of my favorites, too. I am not entirely happy with it. My choice of pink ink wasn't the best choice. It's Worn Lipstick Distress Oxide ink. It doesn't work with the soft pink of the paper as well as the pink shimmer paper. But it is what is. I really need that Tattered Rose color that is coming soon. Can't wait! I'm loving the other two colors of Distress Oxide ink I used - Antique Linen and Faded Jeans. I should have started over, but I just was over it. Please be sure to visit the design team - they did an amazing job. They always do! Anyway.... this week's revisited sketch is up and it's Debbie's pick. I'm glad she picked this one, it's one of favorites, too. My card features papers from DCWV, stamps and dies from MFT Stamps. 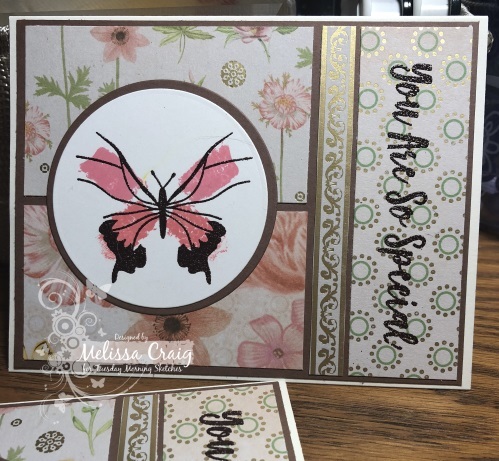 You can't really tell in the photo that the brown of the butterfly and the sentiment is embossed with brown embossing powder. Whoever said embossing powder goes bad is only partially correct. This embossing powder is probably 20 years old. I am totally not kidding! It was probably one of the first I ever purchased when I was first introduced to Stampin' Up! - and I probably bought it to pair with the Button Bear stamp set I purchased which was the first stamp set I ever bought from SU!. How's that for a blast from the past. It actually embossed really well, but it didn't stick in places. Anyway, still love how the card turned out. Please come join us! Don't forget to visit the design team blogs - they work hard for you every week. Hello! Thank you so much for stopping by. It's been awhile, but it has been a wonderful break. I've been crocheting again and I can't seem to stop. So if you've been a friend of TMS for awhile then you know at the beginning of every year we revisit some of our favorite sketches from the past year. Up first is Carol's choice and she picked a great sketch by Janice. 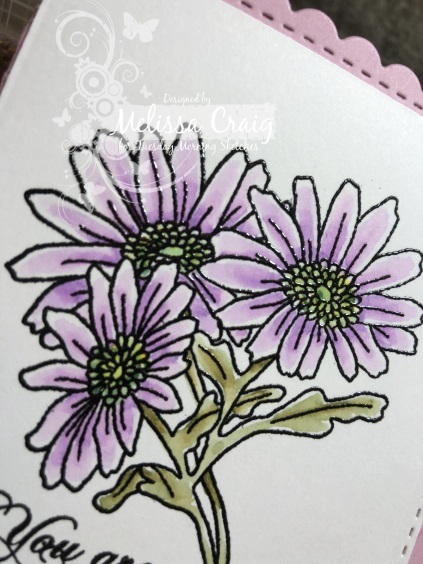 My card features the Dahlia Turn-about stamp set by Concord and 9th. My sisters gave me an Original size MISTI as an I-love-you-gift, we weren't exchanging Christmas gifts this year, so I was pretty excited to use the MISTI with this turn-about stamp. My card also features dies by Papertrey Ink and CC Designs. Ink colors are by Hero Arts. 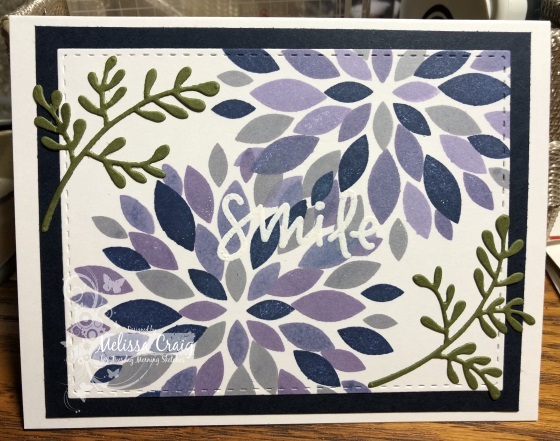 My sentiment didn't stand out as much as I'd hoped and it wasn't until I embossed it that I remembered the dark blue embossing powder that may have worked better. Oh well - the card is still pretty. Please join us over at the Tuesday Morning Sketches blog. There is a super cute embossing folder available for the prize! Also, visit the team's blogs, too. Leave them some much deserved love! I look forward to a new year of creativity with them and you.